The colors used for this composition are based on the color motif of the University of Southern Philippines (USP) logo. The photo of Co-founder Do?a Beatriz Jereza is a studio shot and the best one available. 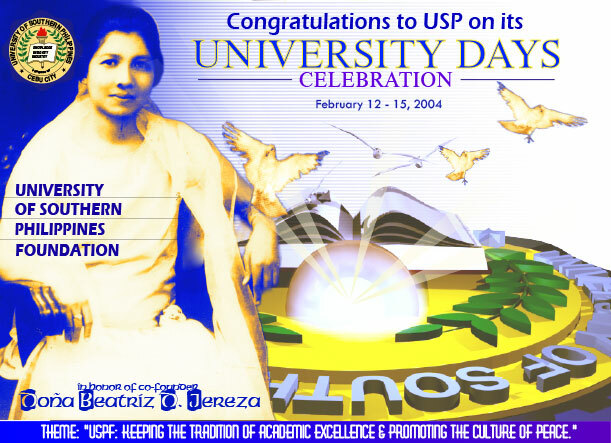 Theme for the event is “USPF: Keeping the tradition of academic excellence and promoting the culture of peace.” we saw a book on the USP logo and instantly knew how well it connects with “academic excellence.” Add the doves as convenient symbols of peace and we have a spectacular image for the event. To make it even glorious, we took the liberty of adding rays to an already bright torch.